This extraordinary 16-day tour takes us to an extremely complex and fascinating part of the world. Persians, Khazars, Arabs, Huns, Turko-Mongols and Russians have all invaded and migrated into the Caucasus, each contributing to the region’s intricate history and astounding architecture. 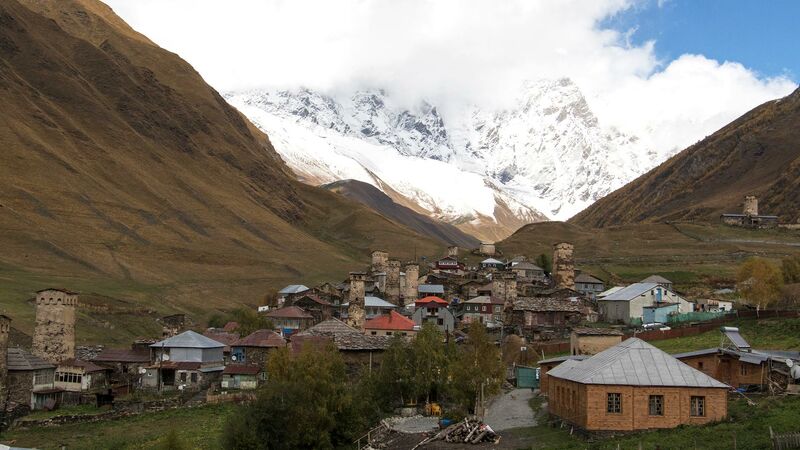 As if this diversity were not enough, the Caucasus also offers a variety of pristine landscapes and stunning vistas just waiting to be discovered. Xosh gälmìsän! We are welcomed to the airport at Baku, the cosmopolitan capital of Azerbaijan, and transferred to our hotel. Check in time starts from 1500 hrs. Azerbaijan, known as the ‘Land of Fire’, provides a rich mix of ancient monuments, dramatic landscapes, glitzy petro-funded towers and people renowned for their hospitality. Scenic and relaxing journey to the town of Sheki. Here we will visit the Museum of Applied Arts, "Shebeke" manufacturing workshops and the magnificent Sheki Khan's palace (view from the outside only). 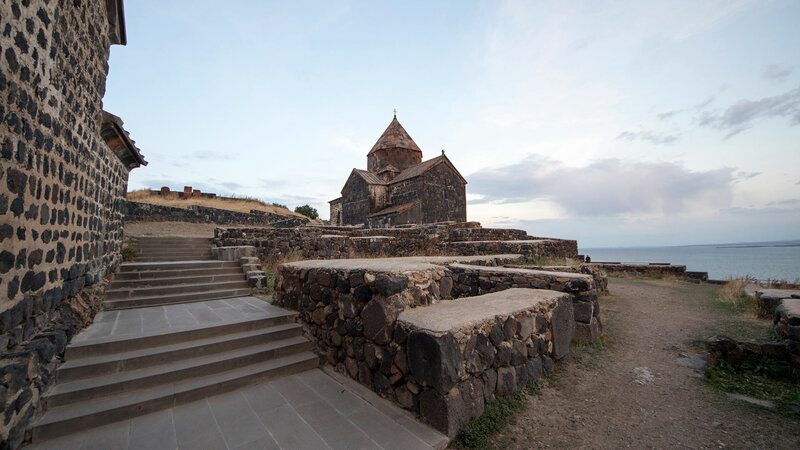 We travel to the nearby village of Kish to visit the first church in Caucasus. The evening is free to relax or stroll around the charming town. In the morning, we leave Azerbaijan as we are driven to the border, where we will meet with our Georgian guide and transport for our transfer to Telavi at 10:00 hrs Georgia time. Kakheti region, Georgia’s famous wine district, lies due east from Tbilisi in a land dotted with fine old churches and vineyard after vineyard. Historically Kakheti was often the centre of political turmoil, however some of the most beautiful and important buildings were erected here and the church architecture is as diverse as the wines in the region. 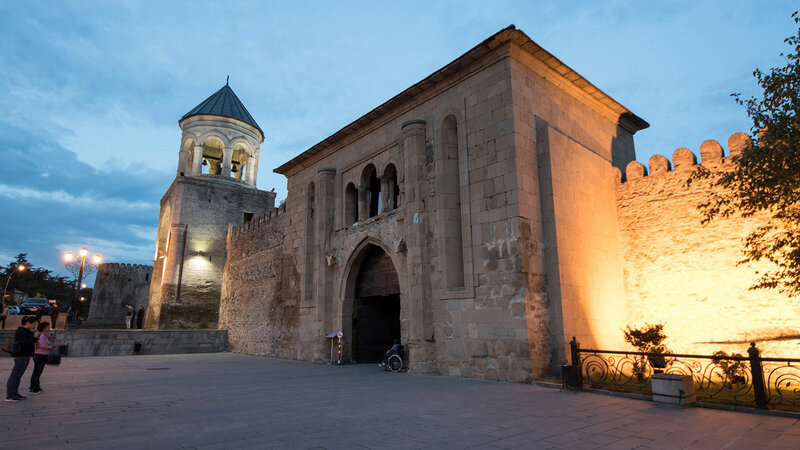 En route to Tbilisi, visit Gremi architectural complex, which consists of the Church of the Archangels Michael and Gabriel (16th century), a three-story castle, a bell tower and a wine cellar. Lunch is taken with a local family, where we can enjoy a traditional home-cooked meal complete with Georgian wines. Learn to make ‘churchkhela’, a traditional Georgian sweet made with grapes and various nuts. Next, visit the fortified, walled hill-town of Signagi. Weather permitting, enjoy fine views of the Kakheti area and eastern Caucasus summits. It is an eclectic mix of old and new. The old section has narrow cobbled streets lined with typical houses complete with wooden balconies and shuttered windows. Note: Please be aware that our Azerbaijan guide and driver will NOT cross the border. Therefore, we should be ready to cross the border on foot through no man’s land. As we will be in the wine producing part of Georgia, it is possible to arrange wine sampling at one of the wineries for an extra charge. 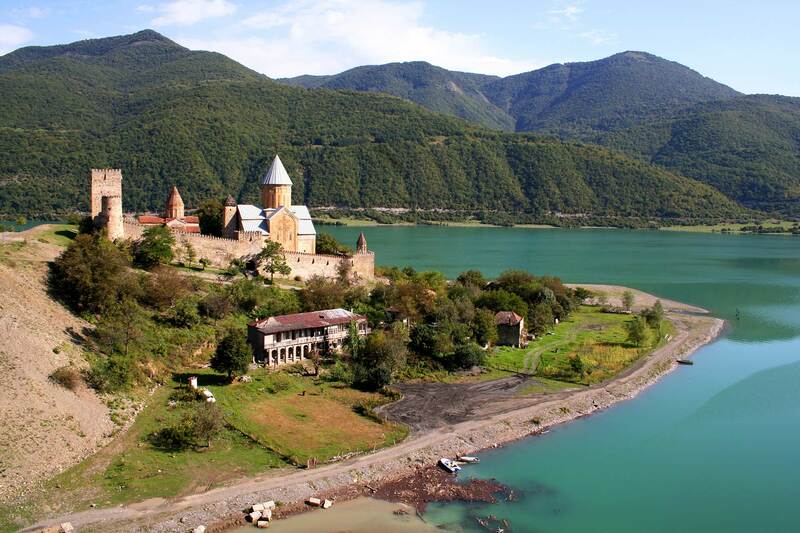 Today we drive to Kutaisi, experiencing Mtskheta* en route. 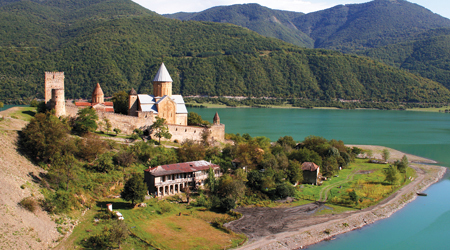 Mtskheta lies in a lush valley on the confluence of two rivers, the Aragvi and the Mtkvari. It was founded in 2,000 B.C. and was the capital of the Georgian Kingdom of Iberia between 500 B.C. and 500 A.D. Georgians adopted Christianity in the 4th century and, thereafter, Georgians, Byzantines, Persians, Arabs and Mongols traded control of the territory until the Russian annexation in the 19th century. It is overlooked by the marvellously simple church of Jvari (6th century), a perfect example of early Georgian Christian architecture. We also visit Svetitsikhoveli Cathedral (11th century), Georgia’s largest remaining cathedral and burial place of the Georgian kings. It has an extraordinary interior combining paintings, frescoes and a domed chapel used for the Christmas service. Both are UNESCO World Heritage Sites. After that, stop in Gori to visit Stalin’s Museum. Arrive in Kutaisi, a city dating back to the Argonauts’ time (13th to 12th century B.C). Formerly capital of old Colchida, Kutaisi then ruled all of Western Georgia. Visit Bagrati Cathedral* (11th century), another UNESCO site. In the morning, visit Gelati Monastery*, founded in the 12th century by Georgia’s most famous king, David the Builder (1073 to 1125 A.D.). Its walls are covered in splendid floor-to-ceiling murals of Georgia’s saints and monarchs. After exploring this UNESCO World Heritage Site, we drive to Mestia. At first, we pass Colkhida lowlands with charming villages, driving along Enguri river valley and stopping at the Enguri Reservoir. Through the mountain road, we get to Mestia* (1400m), the provincial centre of Svaneti. Mestia is a small provincial settlement surrounded by huge Caucasian Mountains, the most impressive of which are Mountains Ushba (4710m) and Tetnuldi (4975m), some of the most severe and beautiful summits of the Caucasus. Today, we also visit the towers and traditional Svan House. This morning, travel down to Zugdidi to visit Dadiani Palace, one of the most eminent palaces in Caucasus. Later, arrive in beautiful Borjomi, famous for its mineral springs. NOTE: On this day, we will have a long drive of approx. 7 hours. After breakfast, drive to Akhaltsikhe. Here we discover the recently restored 13th century Rabati Castle. Then drive to Vardzia, a thirteen-story cave town built between 1186 and 1189 by Georgia’s famous Queen Tamar. It stands as a unique example of the Georgian renaissance in an area of many medieval sites. En route, stop at Khertvisi Fortress. 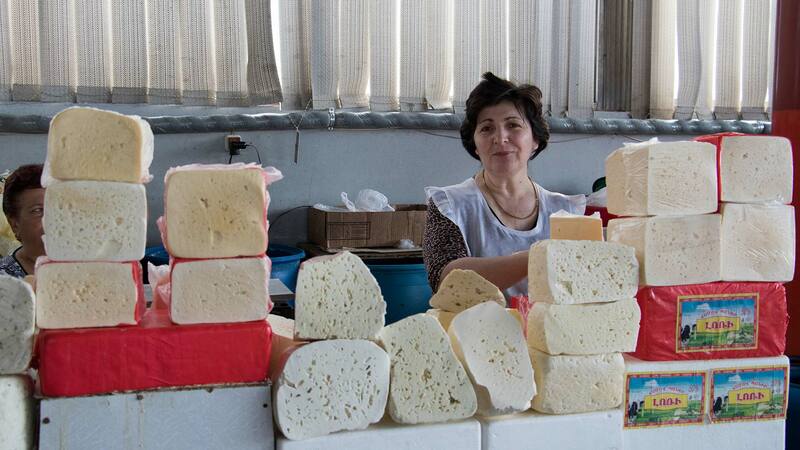 Following breakfast, we journey to the Armenian – Georgian border of Bavra. After border crossing procedures, meet our Armenian guide and driver at 11:00 hrs Georgia time. We enjoy a city tour of Gyumri, the second largest city of Armenia. Gyumri has a distinct look, style and dialect. Next drive to Dzoraget via city Spitak and Vanadzor, accompanied by beautiful panoramas of forests and mountain. Note: Please be aware that our Georgian guide and driver will NOT cross the border. Therefore, we should be ready to cross the border on foot through no man’s land. An exciting day ahead as we tour Sanahin* Monastery. Standing on a high plateau, amidst low structures, the monastery raises sharp against the background of steep forest-grown slopes. The ensembles are complemented by small nearby churches and chapels. Also present are four annexes, sepulchers, bell-towers, the building of the Academy, book depositories, refectories, galleries, bridges and other monumental structures. Lunch in Dilijan, then explore the surroundings city and historical monuments of the area. Wander in the art street of Sharambeyan, chat with the carpenter and pottery masters, see them at work and choose one lovely souvenir. Our next stop is at Lake Sevan, famous for its emerald water and delicious fish. This mountainous lake covers approximately 5 per cent of Armenia’s surface area and is 2000 meters above sea level. Our first stop today is Noraduz cemetery of cross stones (khachkars). We then journey to Noravank. En route, visit Selim Caravanserai, situated in the Selim (Sulema) mountain pass, 2410 meters above sea level on the old road that connected historical Gegharkunik with Vayots Dzor. According to the two building inscriptions (one of which is in Arabic), the caravanserai was built in 1332 by Prince Orbelyan Chesar. The tour culminates with a visit to the 12th century Monastery of Noravank, set in a canyon rich with rare flora. Visit Bird's Cavern, where the world's oldest shoe was found. After our lunch break in Noravank, we take an excursion to Khor Virap Monastery, one of the most popular tourist destinations in Armenia. Its location, near the closest point to Mount Ararat within Armenia, offers a spectacular view of the mountain, the national symbol of Armenia. 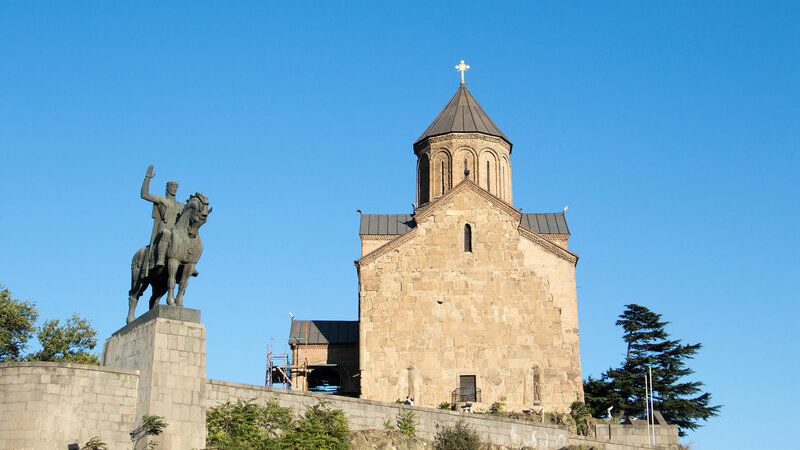 It is also significant as being the place of Gregory the Illuminator's 13-year imprisonment, after which Gregory made Armenia the first country to adopt Christianity as its official religion in the year 301.